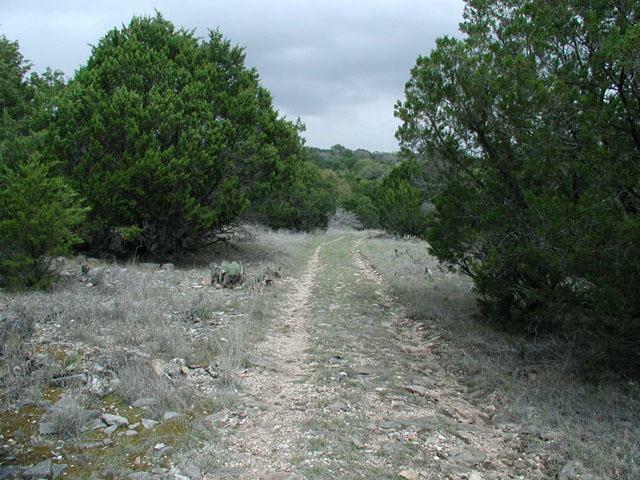 The Hike: Upper Gorman Creek Trail consists of several loops along the western border of Colorado Bend State Park. Unlike the Spice Woods Spring Trail on the other side of the park the terrain here is somewhat flatter and definately sunnier. That makes for an easier hike difficulty-wise and an easier hike in which to get sunburned! This is about as much tree cover as one can expect on the trail. The trails begin at the waypoint "Trailhead", located at the first parking area on the right after entering the park. Please note that the park headquarters is located at the other end of the park, so please make the visit there to pay the entrance fee, or better yet, buy a parks pass and help support the park system. A sign at the trailhead hints that these trails might be called the Windmill Trail, in reference to a windmill found at the primitive camping area along the trail. The park website does make use of the term "Windmill Back Park Area", so be aware that these all refer to the same general area. 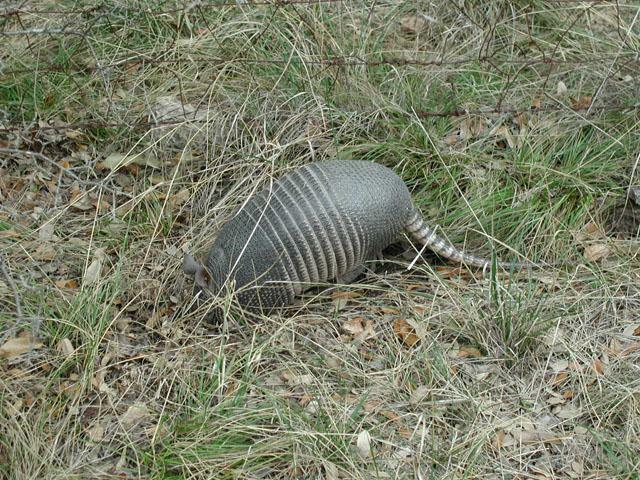 A large number of Armadillos were observed along the trail. 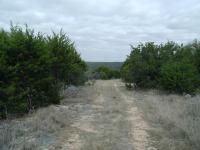 From the trailhead that path heads to the west into the undulating Hillcountry brush. The trails here form several loops, two of which are designated by colored trail markers. The blue trail marker group starts at the trailhead and loops around back to it. The yellow marker group shares a segment with the blue marker group and lies to the southwest. A final semi-loop (marked with "No Trail Markers" according to the official park map) turns to the northeast from the yellow loop and intersects the park's dirt road at the waypoint "Turnaround". It's a short distance from here to the trailhead along the dirt road, but if you want to avoid any dusty encounters with cars and trucks, this is where to double back. A view of the straight trail that connects Upper Gorman Creek with Spice Wood Creek's trail. The blue topo track on the western side of the topo map is a rough approximation of the part of the yellow trail marker loop that I did not hike on my last visit (yes, it's not the best choice of colors!). The blue trail on the eastern side of the map is the Spice Wood Springs Trail that connects to this one via the long straight path. This windmill lies at the primitive camping area. A sign at the trailhead refers to this trail as the Windmill Trail. 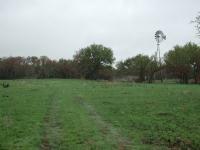 The long, straight trail spur that heads to the east from the Upper Gorman Creek loops eventually connects with the Spice Wood Springs Trail and the Riverside Trails. For much of its length it parallels the dirt road leading into the park, though usually not within sight of it due to the brush. The trail undulates up and and down but otherwise shoots straight as an arrow for most of its 3.5 miles. A short segment of the trail near its eastern-most edge technically hugs the dirt road. But the truth is that is really disappears and you might as well hoof it on the road for about a quarter mile before the trail veers off into the brush again. The Upper Gorman Trail is less used than the two trail systems along the Colorado River and I've never seen more than a few people on the trail during my visits. It may be safe to say that I've seen more Armadillos on these trails, particularly the long, straight segment of the trail, than people. This hike spans the Lively Loop Trail, the Tie Slide Trail and most of the Gorman Falls Trail. Rather than break up my hike for each trail, which would be a lot of unnecessary, self-inflicted work, I will make one single log entry here. Hopefully, in the future, a single park like this one won't be split into 11 separate locations! This hike was long, hot and boring. While it did display some geological and biological diversity, there wasn't much to see. The trails were rocky and difficult to walk on, so be sure to wear good supporting footwear. This is the loop that services the backpacking camping area. It does not have much shade, so head out early in the morning if you are hiking it in August like I did. The trail features pretty classic hill country terrain, and plenty of solitude.. its Quiet! Colorado bend has opened nearly 35 miles of trails now and an overnight backpacking trip starting and ending at the spicewood springs trail would be fun.. you can now loop the entire park for a great trip! go for it! Went back to Colorado Bend to finish off some trails that I didn't get to do the last time. Drizzled for much of the hike and only saw two other hikers on the trail. Did spot on dead Coyote half way on the trail that has probably already been worked over by the vultures by now. These trails are flatter and potentially sunnier than Spice Wood Springs, so bring sunscreen. Wouldn't have needed it today though. In addition to the Spice Wood Springs Trail I hiked the connecting trail between it and the Upper Gorman Creek Trail. By then I was ready to turn back and head home. Though the trail does parallel the park's dirt road for much of the way it's often distant enough and the traffic light enough that it's not an issue. It's flatter than the Spice Wood Springs Trail with some more Sun exposure. 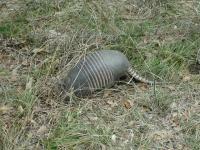 Saw two people at the end of the trail (near the loops to the west) but saw about 4 Armadillos on the way. A good trail, though the yellow trail markers are few and far between. I intended on hiking the smaller loop but took the bigger one by mistake. Still enjoyable. However, seeing the park borders as often as I did reminded me that, though there is no one around, one is not completely alone...hence the 4.5 on "Solitude". Wildlife: Many birds to see and the armadillos were everywhere!! In every clump of oak and juniper, there as a noisy little armored beast routing away at the soil and leaves...It's amazing they survive in the numbers they do being so aloof to possible "threats". Can't wait to explore the rest of the is park.